Congratulations! 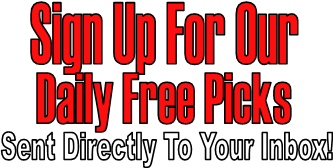 You have successfully signed up for our Free NHL Picks by email. You will now begin receiving the picks daily. This is a reminder to all gmail users that gmail emails are now directed into 1 of 3 boxes: Primary, Social, and Promotions. By default, our emails will fall into your “promotions” tab. If you don’t see our Daily Picks in your inbox, they may be hiding in your promotions section! No worries though, you can simply check the promotions section daily, OR if you prefer, you can select any of our emails and drag it to your primary inbox, and then gmail will ask if you prefer to have these sent directly to your primary inbox. If you choose yes, all future emails will be sent directly to your primary inbox! Simply add us to your address book to ensure you never miss a pick! Some email clients may tuck emails away thinking they are spam. You can easily prevent this by adding us to your address book or safe sender list!